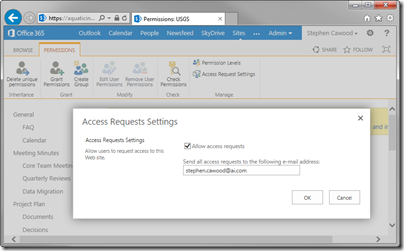 The option to set the email address for any SharePoint site access requests has moved around in the last few versions, so I thought I’d post this for those searching through old posts looking for one about SharePoint 2013. This setting determines who will receive an email when a user requests access to a particular site—usually when the user tries to access the site and is denied. The tricky part is that the email address for this request is not related to the site owner permissions, it’s just a string. First use the gear icon in the top-right corner to get to the Site Settings page. If you don’t see the Site Settings link, you probably don’t have sufficient rights to make this change. 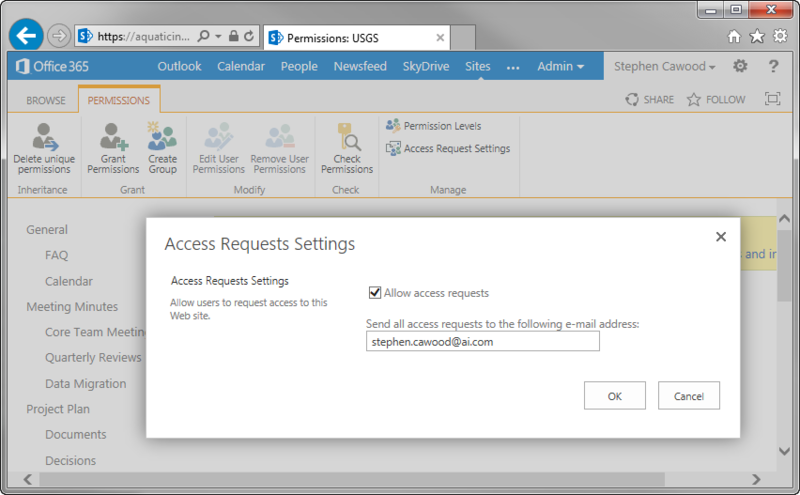 Once there, click on Site permissions. Simply enter the email address you’d like to use for access requests and you’re done. I recently made the decision to refactor a 600 page software manual. That’s a daunting task, so why did I do it? The old format was barely working, inflexible, required a truly awful propriety tool, and cost the company considerable time and money when changes (such as translations) were required. The underlying pages were in HTML, or at least the closest thing to HTML that still actually worked. In reality, the code was awful; there were broken tags and redundant tags all over the place. The editor in question (developed by a small company in Hawaii) is nothing more than a wrapper around Microsoft’s free HTML Help Workshop tool. I decided to clean up the HTML (read: convert it to XHTML), dump the editor and dynamically build the manual the same way I’ve done at companies in the past. This is an ongoing project, but here’s how I handled the task of cleaning up ~600 HTML files, so they were in valid XHTML. HTML Tidy is convenient way to repair poor HTML. It doesn’t fix everything, but it does help and it makes the code look a lot better since it will fix much of indentation. So the first thing I did was run this HTML Tidy command on all the files. I ran this in Git Bash after turning off word wrap in tidy settings file. Even with the word wrap option, HTML Tidy inserted more newlines than you’d expect, so it isn’t perfect, but it made a big difference. 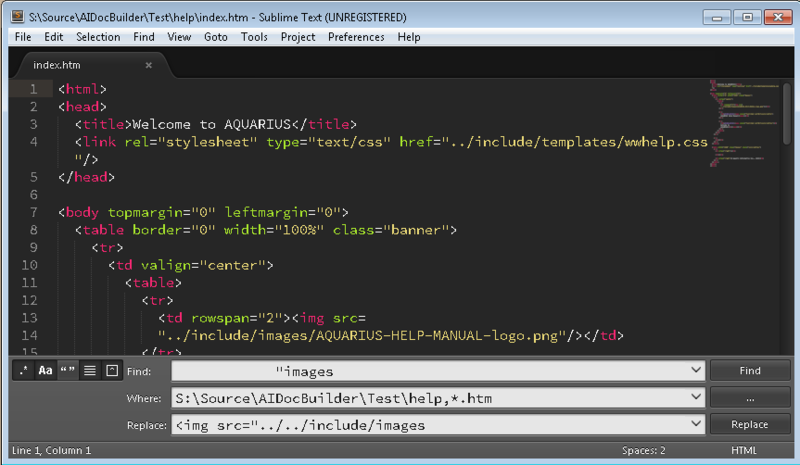 Note that you can remove the HTML Tidy watermark pretty easily using find/replace in Sublime. And that is a nice segue to the next step. 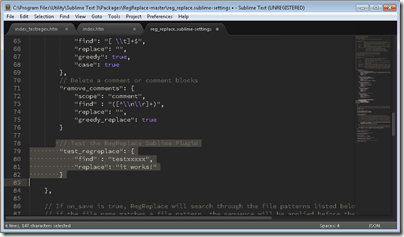 Using the “Find in Files…” feature, it’s easy to make simple text substitutions in Sublime. For example, to be XHTML compliant, I need to convert &nbsp; to &#160;, <BR> to <br/>, and many other examples. I also needed to simply remove some tags. For example, tags added when someone pasted text from Microsoft Word into the editor (e.g., <o:p> and </o:p>). Sublime will help you figure out the syntax to match just the current open file, all open files, or a whole directory structure. For example, in the “Where” box for Replace, you might enter c:\directory\test,*.htm to match all .htm files. Simple find/replace actions got me part way there, but they wouldn’t solve all the issues I had to deal with in the broken HTML. The next step was to use Regular Expressions to enable some more sophisticated corrections. One example, was attributes within HTML tags (such as size, height, etc.) that weren’t enclosed in quotation marks. Browsers will deal with that transgression, but it’s not valid XHTML. I had to find a quick way to add the quotes around these attributes in ~600 files. The answer was find/replace using regular expressions in Sublime. This creates two capturing groups with “size=” as the first and any number of 0-9 characters as the second. This replace command encloses the second capturing group in quotation marks. For example, size=100 becomes size=”100”. Well that’s all for now. I hope you found this helpful. 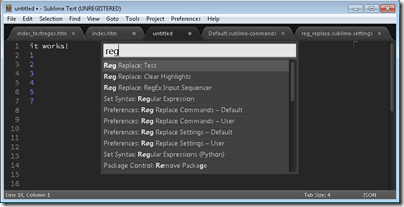 I encourage you to try the RegExr online tool; it’s helpful when refining regular expressions. Just like everyone in the software industry, I’ve used many, many different text editors over the years. vi, Emacs, Notepad, Notepad++, TextPad, nano, gedit… to name a few. But, of course, there is a ridiculously long list of text editors and I haven’t tried that many of them. The one that I’ve been working in for most of this year is Sublime Text. 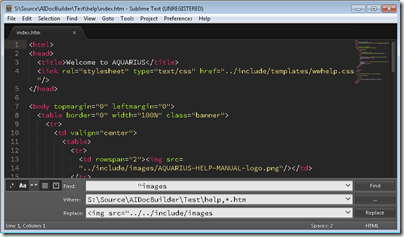 Sublime’s tag line is “Sublime Text: The text editor you’ll fall in love with.” I may not be in love yet, but I’m definitely checking it out a lot. In addition to having excellent functionality built-in, Sublime also supports a plug-in model. 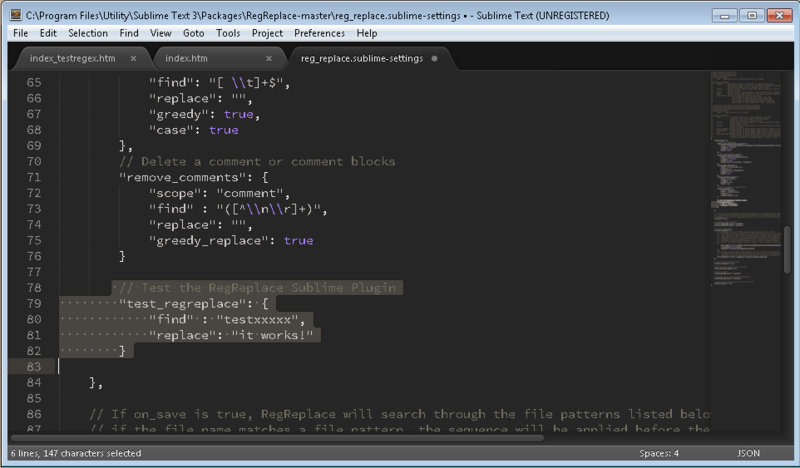 There is the GoSublime plug-in for golang code and there’s the RegReplace plug-in that allows one to write find/replace commands using regular expressions and save them in script as Command Palette commands. As you can see in the installation instructions for Package Control for Sublime Text, all you have to do is open a Sublime Text console (Ctrl+`) and paste in the install code. Option 1: After installing package manager, download RegReplace, unzip it and paste the unzipped folder into your Packages folder (e.g., C:\…\Sublime Text 3\Packages). Next, go to Preferences > Package Control and choose “Package Control: Install Package.” Then choose the package you want to install from the list. To do this, choose Tools > Command Palette > Then type “setting” and you’ll see “Preferences: Reg Replace Settings – User.” Choose this option and paste the example one that comes with RegReplace into the new file that’s created. Step 5: Try it out! Once you have everything set up, you can use the Command Palette to run your new custom find/replace regular expressions scripts. 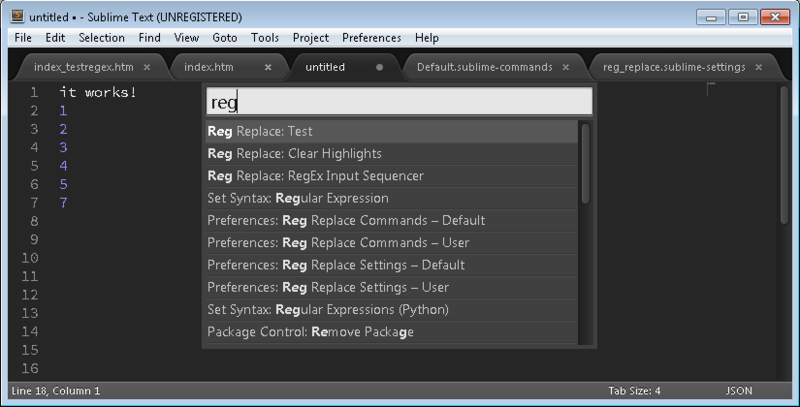 Note: After installing RegReplace, I received the an error when trying to add my test code to reg_replace.sublime.settings. The error was something like “Cannot save. Can’t create .tmp file in RegReplace folder.” To work around the issue, I opened the security settings for the folder and added write permissions for all users. A bit overkill, but in my case, it’s a secure machine.